PTLLS is abbreviation for Preparing to Teach in the Lifelong Learning Sector, and it is the minimum requirement for teaching in the further education sector in the UK. PTLLS qualification is gained through completion of theoretical assignments and practical tasks along with reflective journal entries leading to either Level 3 or Level 4. 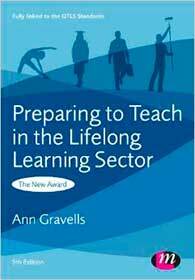 The most recommended book by most centres is the revised PTLLS Book by Ann Gravells . How Can PTLLS Help You? You will benefit mostly from the number of hours you dedicate to writing your essays, self-reading and researching - not less than 30 hours. The guided learning is also very useful. And remember to get your PTLLS Book from Amazon as early as possible. To find out more about PTLLS qualifications and assessment materials visit the City & Guilds website. Your centre will encourage you to register for the CIPD membership giving you access to resources and member benefits, this is necessary especially if you will choose teaching as your career. The course cost varies from centre to centre. This page will be updated soon to to provide information about the Award in Education and Training (AET) following the introduction of Level 3 Award in Education and Training (EAT). Get your PTLLS Book from Amazon today.